With London Fashion Week Fall 2018 wrapping up this week, our eyes have been focused on the British runways. 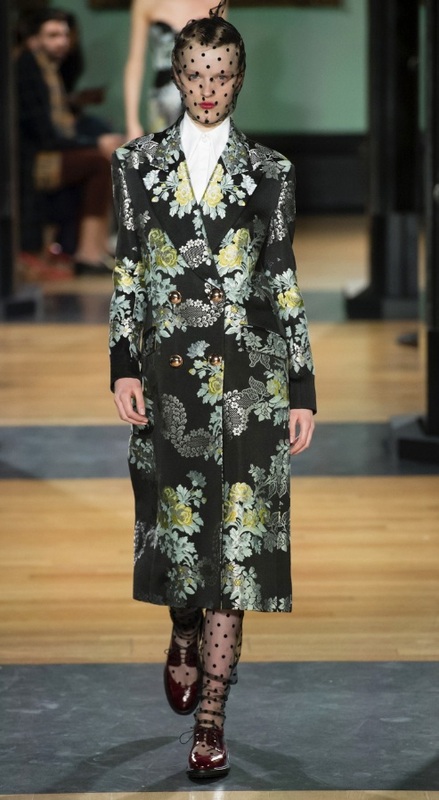 From explosions of pattern at Erdem to seductive appeal at Christopher Kane, the latest collections in London have ranged from modest to modern. Here’s a closer look at our roundup of top looks from LFW, and a sneak peek of runways trends for the season to come. The Montreal-born and London-based designer might be proudly Canadian, but he has been a fixture on the London catwalks for years. Erdem Moralioglu presented his latest collection at the National Portrait Gallery, inspired by dancer Fred Astaire’s older sister, Adele. The elegant Fall 2018 line featured plenty of florals, with embroidered blossoms and shades of yellow and white. Brocade coats, strapless dresses and billowing capes were all signature looks. Designers Peter Pilotto and Christopher de Vos unveiled a 70s inspired collection, staying true to their signature bold prints. From funky neon shades to kimono dressing and flared trousers, the disco decade made a statement in full force. Sorbet shades of pink, orange and red also brightened the catwalks. At Burberry, Christopher Bailey unveiled a show which concluded his 17 year old tenure at the iconic luxury fashion house. On the runway, 1980s and 1990s influences made an appearance, in the form of rainbow tones, mismatched patterns and over-the-top florals. Traditional wool coats shared the stage with old school sweatshirts, pastel windbreakers and athletic bombers. Overall, a mix of streetwear, athleisure and classic outerwear took over the runway for Burberry’s dramatic, colourful new collection. Designer Christopher Kane presented his Lover’s Lace collection which had a subtle sexual theme and a seductive feel. Models strut the runway beige three-quarter length coats, but these wear adorned with puffed power shoulders and glam black leather collars. From intricate lace accents on leather frocks and white blouses to lacy, sheer frocks, this fabric was certainly a statement look. Colours varied from crimson and basic black to deep burgundy and grey.